With a dramatic bayside setting and modern amenities, this eco-friendly hotel introduces you to the very best that Florida has to offer, from natural wonders to unique culinary surprises and cultural discoveries. The spacious guestrooms and suites have private balconies with city, marina or sparkling bay views. During the day, stay cool with a variety of water sports, including kayaking and paddle boarding. Dine on cuisine that integrates thoughtfully sourced produce at at Currents Restaurant. 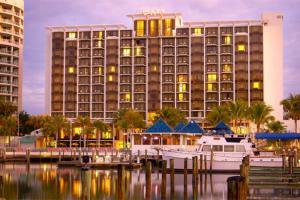 This hotel is located 4 miles from Sarasota Bradenton Airport.